Visit our new woksite - www.wokshop.com/newstore. 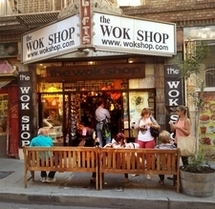 The Wok Shop is located in San Francisco's Chinatown, we've been selling woks for over 40 years. Wok shopping? Wokology 101 might answer a few questions and help you decide before purchasing your wok. Don't miss our video on How to Season a Wok or Grace Young's Season Woks with Flaxseed Oil! Learn how to get your new woks ready to cook! Here is an article about our store. More items also available at wokshop.com/store. Enjoy a walking tour of Chinatown Prepare yourself. These tours are a feeding of the mind by a street poet of America's most food-obsessed ethnic neighborhood. It is art. It is history. It is fun. But most of all, it's delicious. Watch this healthy stir fry tips video: Grace Young's Craftsy cooking class: Throughout the class Grace uses the Wok Shop's flat-bottomed carbon-steel wok -- her all-time favorite pan. Be sure to watch her Craftsy cooking class on how to care and maintain your wok!